Most of you know I live on Canada’s East Coast, but not everyone is familiar with what it’s like to be a Maritimer, so I thought I would write this for my further-away readers. Last year I created a website to advertise a job, and part of it was to promote my area as a place to live. We hired someone who seems to like it so far! Let’s say you’d never heard of Halifax or Nova Scotia before. Would this entice you? 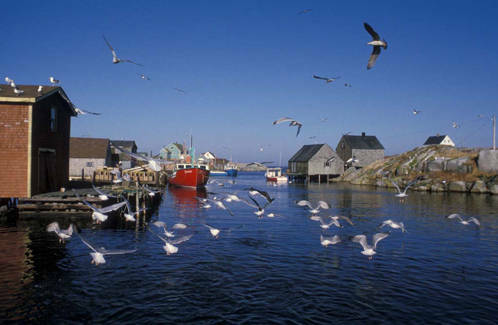 Nova Scotia is the eastern-most mainland province in Canada, and is almost entirely surrounded by the North Atlantic Ocean. We don’t benefit from the warming Gulf Stream, but we are far, far below the Arctic Circle! No matter where you go in Nova Scotia, you are never more than 40 miles from the ocean – that’s only 40 minutes on our low-traffic highways. But most of us live much closer to the water – I can zip out for a walk on the beach in just 15 minutes! 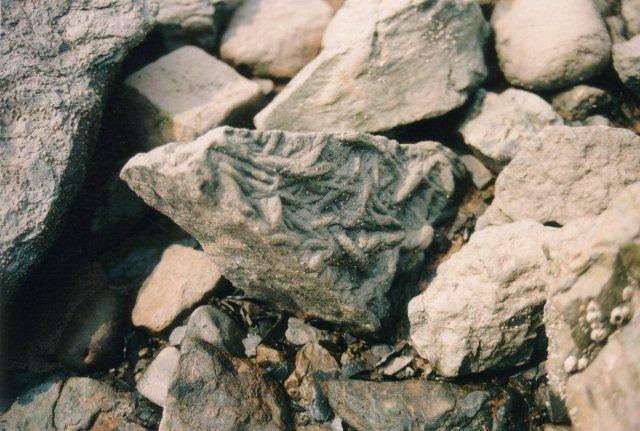 We have 5 types of shoreline (I am making this up from my own observations): sandy beaches, of which there are many; rocky beaches; rocky cliffs; forests that go to water’s edge; and industrial uses such as fishing, container shipping and The Navy. Canada has lots of big cities like Toronto and Vancouver; Halifax isn’t one of them. However, if you grew up in a rural area or a small town, you’d find Halifax has enough amenities that you feel like you’re living an urban life. 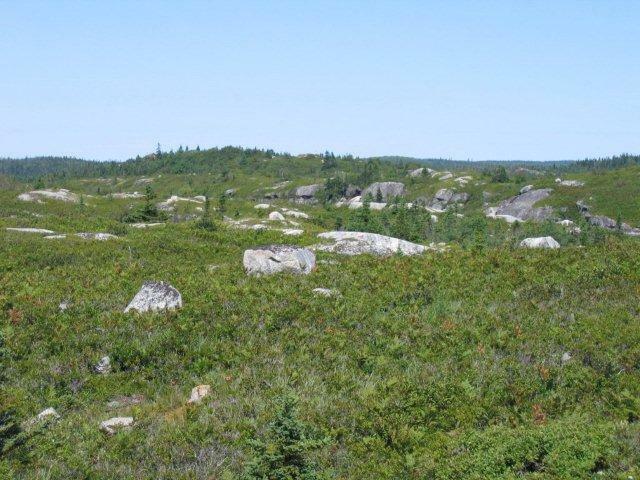 The “city” part of Halifax (comprising two cities and two towns) has about 240,000 people, with another hundred thousand in the surrounding countryside. Because the city was incorporated over 250 years ago to defend a harbour, it certainly doesn’t have a modern grid layout, but way-finding is easy: all roads are either parallel to the water, or lead to the water! Halifax was always a military and government centre, not a manufacturing one; so we don’t have the “brown sites” that you see in some older cities. While an old downtown area has faded, new waterfront developments are thriving. Nova Scotia is known for being small, quaint and picaresque once you get outside Halifax (or maybe inside too, depending on your point of view!) Tourist web sites will tell you all about our scenic lighthouses, winding coastal highways with dazzling sunsets, and launching out for a day of ocean kayaking. You can take pictures of colourful dories and chat with fisher-folk on the wharves and buy a couple of lobsters or a whole fricking tuna. What you won’t hear is that you’ll do so in cool, foggy weather, and the muddy ocean floor at low tide has a bit of a pong, but we’ll keep that quiet! Nova Scotia has 2, maybe 3, big tourist attractions. Peggy’s Cove is known for its lighthouse, but for locals, the fascinating thing about Peggy’s Cove is the rocks. 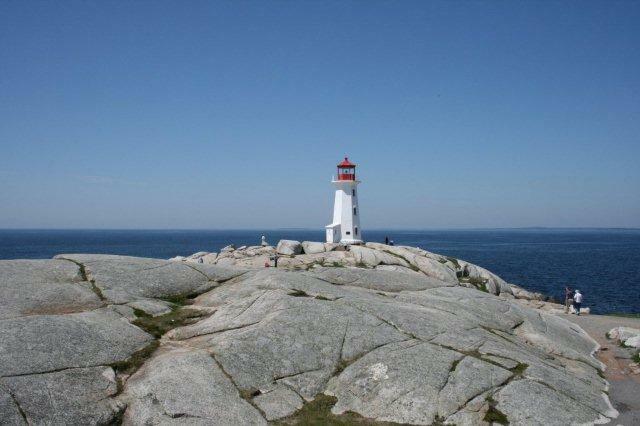 The lighthouse is perched on a wide expanse of rounded, weathered rock. It is really fun for families to go there and spend an hour scrambling up and down all the mounds and crevasses – you can cover a lot of ground without risking yourself at the water’s edge. 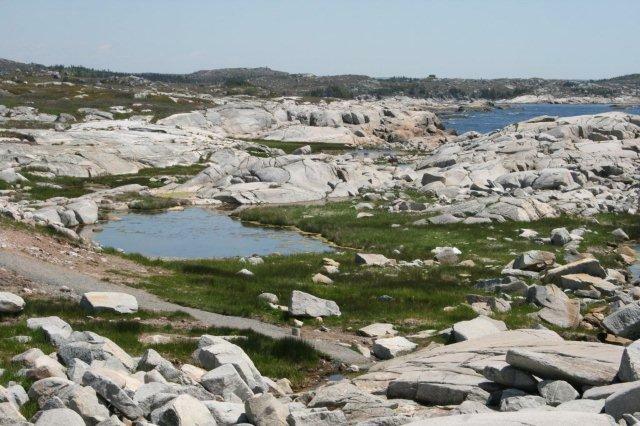 Real geology fans will be even more interested in the glacial terrain approaching Peggy’s Cove – the fields look as though they were seeded by stones which sprouted into random boulders. It doesn’t hurt that the route to Peggy’s Cove is lined with folk art studios. And there are plenty of sea-themed gift shops and fish n’ chips offerings. By the way, all of our better fish n’ chips shops feature fresh battered haddock! 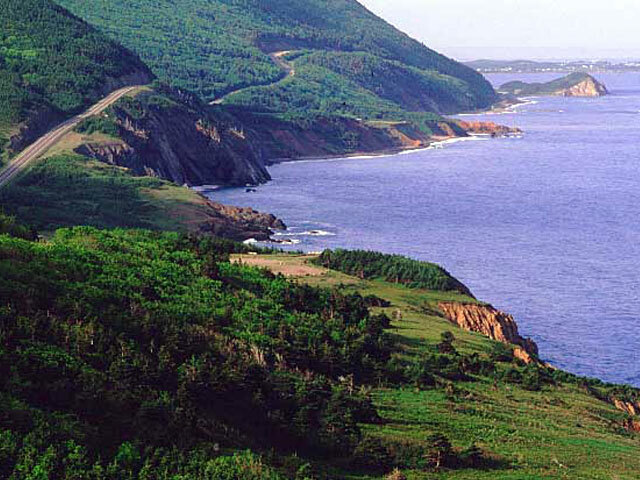 The Cabot Trail is a 300 km scenic coastal highway on the island of Cape Breton. You cross a causeway off the mainland and take the route counter-clockwise so you stay on the water side. As you drive along the cliffs, there are lots of look-out points where you can pull your car over. The coast is rugged, but not “terrifying rugged,” although I certainly wouldn’t drive it in a snow storm. The only place in the world I’ve seen that rivals the Cabot Trail in coastal beauty is California’s Highway 1 from Monterey to Morro Bay. If you like perching on a cliff and being able to see hundreds of miles of forest and rock and sea (I do! ), then you must visit. Science geeks like me will also visit the Alexander Graham Bell Museum to see his many inventions including flying machines! I’m only rating the Parade of Sail a “number 3 status” because it’s a festival that occurs every few years! 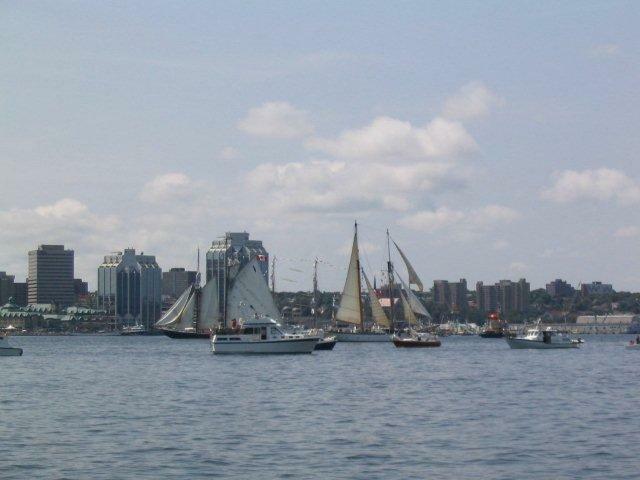 Halifax is one of the deep harbours that plays host to dozens of reproduction sailing ships. The Tall Ships festival lasts for a few days in July. The ships dock and allow visitors aboard. The city has a party atmosphere and is awash with costumed pirates and sailors! When the ships leave town, they sail together as a flotilla in a graceful arc around the harbour. I haven’t even mentioned the fossil cliffs at Joggins and Blue Beach, because I’ve already gone on about rocks far too much! I’ve just described the big ticket items. Most of what I like about my home province is more “down-home,” as we say. I like it that Nova Scotia is hilly and covered by forest. I like that there are thousands upon thousands of lakes, rivers, and streams – my part of the city has 23 natural lakes. Where my parents live, just ten minutes from the city, they regularly spot otters, mink, muskrats, great blue herons, bald eagles, kingfishers and osprey. In the woods around their home are beautiful wildflowers like lady’s slippers and trilliums. Deeper in boggy woods, you can find the carnivorous pitcher plant! Having lived away from Nova Scotia for 15 years and come back, I find the people here uniquely humble and matter-of-fact. Government, tourism and service industries are our biggest employers since the collapse of the cod fishery. With a population of less than 1 million, we can’t create a big economy. The elders are sad to see young people get educated and move away to technical professions elsewhere. But lots of us like it here, get educated, and stay put. The monetary fallout is the price we pay. An interesting side effect is that people are rarely judged by their jobs or incomes. I find people don’t ask, “Where do you work?” or “What do you do?” – in deference to the fact that many people are employed outside their profession, or are struggling to find work in their geographic area. In my grandparents’ time, women moved away to “the Boston states” to work as domestics for wealthier families, or work in the mills. In my time, young men move to Alberta to work on the tar sands, and we all grimace and hope they’ll come back. The cost of living here, outside the city centre, is very affordable – for example, a house in central Halifax would cost $400K while a suburban one can be had for $200K, and in rural areas even less (if one can do without city services). And people are proud of their thriftiness, which I found refreshing when I came back! The only tough thing about Nova Scotia is that, if you’re not from here, you are forever a CFA – a Come From Away. After twenty years, you’ll be accepted as “that guy; he’s from Ontario” without a dismissive wave, because you’ve stayed the course. While everyone is friendly out in public – and we all talk to strangers – it’s rare you’ll be invited to someone’s home. That’s because we don’t want a CFA to look down on us for our messy living rooms and lack of home-baked treats to offer you. When you “have company,” you have to do it right! I bet everyone out there thinks that no one out in Blog Land wants to hear about their “boring” home county, state or province. But trust me, I do, and I would love to read your take on where you live! Come back tomorrow and I will guide you through a weekend in my city! I’m be honest, I always love your posts but when I started this one, I stopped, cause I thought i wouldn’t like it (and the glare on the screen wasn’t helping). But then I came back to it, as I know what you write is always wonderful and ‘endured’ – and was pleasantly rewarded! I definitely couldn’t/wouldn’t live there for the temperature extremes in the cold sense – I just can’t get my head around that! I’ll definitely post about my home town (and currently Economies of Kale’s – we could do a ‘grew up here post’ and then a ‘moved here post’ for contrasts) and then I could write about Sydney. I bet I’d end up on the memory lane, rather than the factual route like you though! Thanks, Sarah – I would love to hear about where you are! It looks absolutely stunning from those photos! I am always wondering what the place is like on the other end of the blogs I read – really enjoyed reading this! I love outdoorsy places like this. I can really see our family trekking out to the lighthouse (stopping at the art studios) or visiting the Tall Ships. Thanks, Fiona – I really liked your post about going to the parade – it gave me a sense of where you are. I’ve long heard from friends that Nova Scotia is a beautiful place, but now I realise what they had meant. And Halifax — gosh, it’s postcard perfect. I was also intrigued by your brief description of the culture and mannerisms of the residents. And I do like how they sound: down-to-earth, humble, and thrifty. A lovely place to live. Where I live now, Melbourne, is my adopted home. Although I have been here for 14 years, I am not confident I’ll be able to do it as much justice as you do your city. I might try when I feel brave enough. I bet you have a clear-eyed perspective on where you live and would notice things that lifetime residents wouldn’t – I’d love to read about it from your point of view! 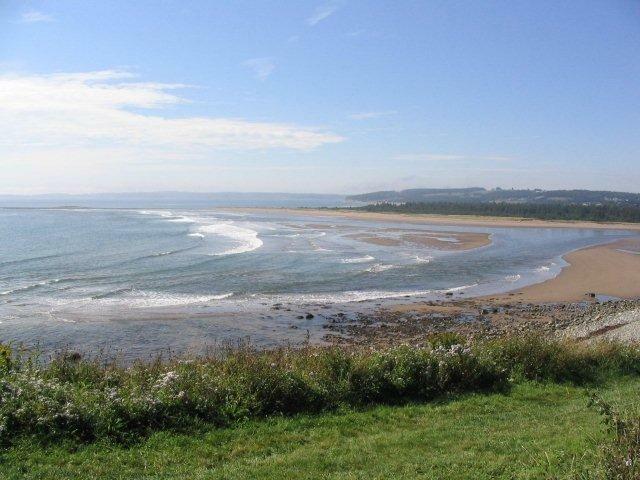 My dad was particularly fond of Nova Scotia, when I was a kid. He managed to travel there on a few occasions. I think he was enamored with the fisherman’s lifestyle. It’s a beautiful place. Recently we were living in Yellowknife, NWT. When it came time to leave, we really tried hard to move to Nova Scotia. I love the ocean (having spent 20 years studying and working in the field of marine and aquatic biology). Alas, we could not line up work for myself or my husband. Jobs were secured in Ontario, which is also our home province, and we moved there. 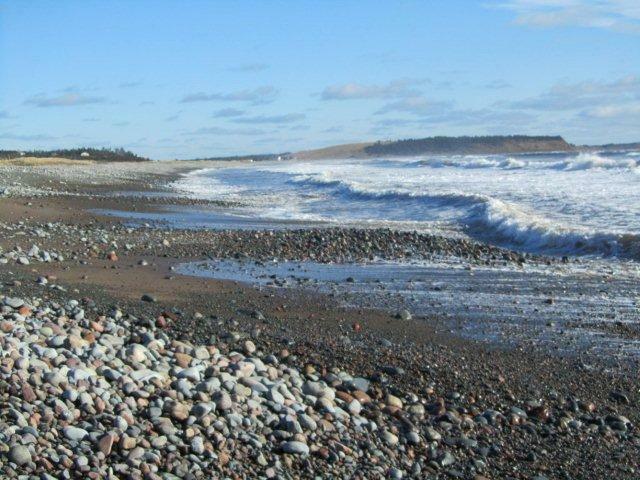 I still dream of living near the ocean again one day (lived in Vancouver for a duration), but while work must be had I will have to settle for visiting Nova Scotia and make due with the great lakes . You are very lucky imho! Well, that is exactly the reason that most of us leave NS – it’s hard to find work in a professional career given the tiny job market and economy. When I moved back, I lived on savings for 20 months until I found work at a management level – it was hard to decide whether to lower my sights. I hope you like where you are – the Great Lakes are pretty great! I know yours is, too! Wow, I’ll have to visit there. I’ve only been to Victoria and Vancouver, BC in Canada. I love Vancouver and have been to Victoria once (would love to go back). I hope you make it up this way!